White Rock Brewing was incorporated in 1994 and opened in South Surrey that same year. Rob Fisher purchased the struggling brewery in May 2012. Al Clements was hired as the R & D brewmaster to build the beer recipe library to meet changing consumer preferences, he is paying particular attention to the trends of craft beer aficionados. In the Spring of 2014 the Provincial Government was considering changes to liquor licenses, these changes made it possible for us to open the all new White Rock Brewing Tasting Room, Rob’s impassioned answer to his customers wanting to buy the freshest, most delicious beer possible, in a growler, whenever they want it. If you enjoy drinking great craft beer, it’s essential that you drink it fresh. The flavor and aroma-producing oils and acids in hops deteriorate with exposure to time, air, light or warm temperatures, so the easiest way to ensure that your brews are bright and flavorful is to enjoy them as soon as possible after purchasing them. Did you know that the most environmentally friendly way to purchase beer is a growler? 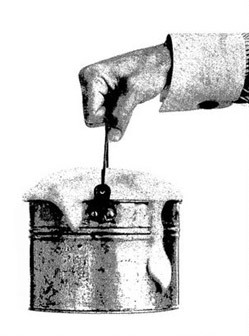 Before bottled beer became economical and common (especially after the widespread use of pasteurization in the mid-1800’s) in the US, if one wanted beer outside of the saloon, bartenders would pour their fresh beer into a galvanized bucket and close it with a lid, then the soon-to-be beer drinker would carry his draught home. The beer would slosh around in the bucket, releasing carbon dioxide as it did so. And, as the CO2 built up and escaped through the lid, it would create a rumbling growl. This, rumor has it, gave the growler its name.